The latest 9mobile SmartPak data plan is valid for 7 days and it works only on social media apps and websites, not all but the most popular ones like Facebook, Whatsapp, and Instagram. 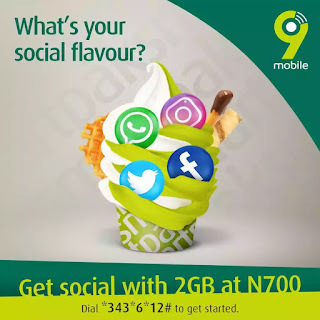 This 9mobile SocialPak plan works on all 9mobile sim, everyone is eligible for this offer and any device can benefit from this offer. I have also linked to the settings to power all apps using tunneling VPN like AnonyTun, with the help of this VPN, you can use the 2GB for N700 to browse any website and download with your 9mobile Sim, as expected this was coming, lol. Let's head to the subscription code and details about this new plan. To purchase the Socialpak plan, dial *343*6*12#. It costs N700 and you will be given 2GB. This 2GB is valid for 7 days i.e 1 week and after that it auto-renews, but you can prevent that if you dial *343*5*0#. With the help of the settings provided on this blog (UcheTechs.Com), you can browse and download with the 2GB instead of only chatting with it. To Power all apps with AnonyTun, check it HERE. Remember 9mobile official Data Plan (1GB for N200), valid for 3 days is still working, that's their best plan for now. Have questions? Scroll down a bit to ask, don't forget to share this post with friends.